When it comes to crime, truth is often stranger than fiction. Many of the cases that have stumped investigators are among the strangest on record. Whether due to a lack of leads and evidence or to bizarre and baffling circumstances, many of the mysteries presented in this book have remained unsolved despite years of investigation by qualified law enforcement agents. Several of them have become legendary and drawn the attention of amateur sleuths around the world, but still they remain open. 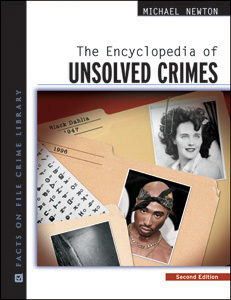 Written in a straightforward, A-to-Z format and featuring 69 black-and-white photographs, The Encyclopedia of Unsolved Crimes, Second Edition presents criminal mysteries from the 19th and 20th centuries, including murders, robberies, missing persons, kidnappings, serial killers, and more. More than 800 cases in total are examined, presenting readers with the facts, evidence, and theories connected with each one. Each entry documents the events of the crime, the victims, the alleged perpetrators, the key points of the police investigation, and the current status of the case. More than 90 new cases have been added for the new edition, and many others have been updated to reflect recent developments. "...a useful starting point for further research." "Suitable for college or public libraries, this book will entertain and inform any mystery or crime aficionado with factual and well-researched information."